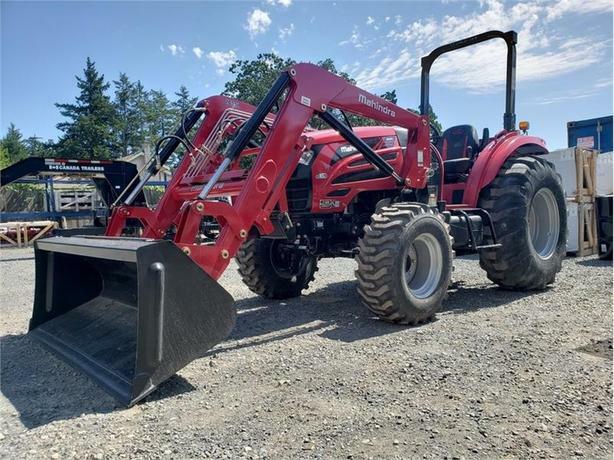 2018 Mahindra 2655 ShuttleA solid choice for general-purpose farming, agriculture, livestock and grounds maintenance, this tractor is an economical and easy to operate 4WD, Tier IV workhorse. Powered by our unique mCRD(TM) engine technology for reduced emissions, this tractor provides reliable performance and added fuel efficiency. Available in 37 to 65 HP and 3- and 4-cylinder engines, this tractor allows you to customize your machine to your specific operation. Coupled with our optional heavy-duty loader and backhoe (among other attachments), this tractor is a sure-fire bet to best suit your needsFeatures may include:Push button cruise settingsHeavier three point linkageWide entryHood lifts high, panels come off, no tools requiredGreat serviceability accessTilt WheelFlat deck platformRounded fendersRedesigned front grillPush button wiper and work light switchCup holder9 x 3 Constant Mesh gear or twin petal HSTStandard rear remote valveShifters at operators sides, not on the floorPowerful, reliable 55 hp 3-cylinder engineAdjustable Suspension seatComfortable padded rubber floor matGreat visibilityModern dash and switchesRedesigned headlight assemblyStorage trayStandard AM/FM stereo with CD player|Over 3000 lbs loader lift, No DP, No DEF, simple and reliable with 7 year warranty.